The first Republican candidate to throw a hat into the ring for 2016, Ted Cruz had been preparing for his presidential run since 2013 when he went hunting in Iowa and vacationed in New Hampshire, both key states in the nomination process. Margaret Carlson, “In Iowa, Ted Cruz Shoots Ducks in a Barrel,” Bloomberg View, 29 October 2013; Steve Peoples, “Sen. Ted Cruz of Texas Heading to New Hampshire,” San Jose Mercury News, 13 July 2013. He had also strongly opposed the Affordable Care Act while showcasing his family side by reading Green Eggs and Ham aloud in a filibuster attack on the act. “Cruz Filibusters with ‘Green Eggs and Ham,’ ‘Redneck Rules,’” 30 July 2015, http://abcnews.go.com/GMA/video/tea-party-senator-ted-cruz-filibusters-attack-obamacare-20366644. If Cruz had been campaigning all along, why make a grand announcement at Liberty University in 2015? First, by officially declaring his candidacy at Liberty University, whose stated mission is to provide “a world-class education with a solid Christian foundation,” Cruz sought to demonstrate that his values were the same as those of the Christian students before him (Figure). Brandie Peterson, “Election 2016: Why Ted Cruz Picked Liberty University,” CNN, 23 March 2015. 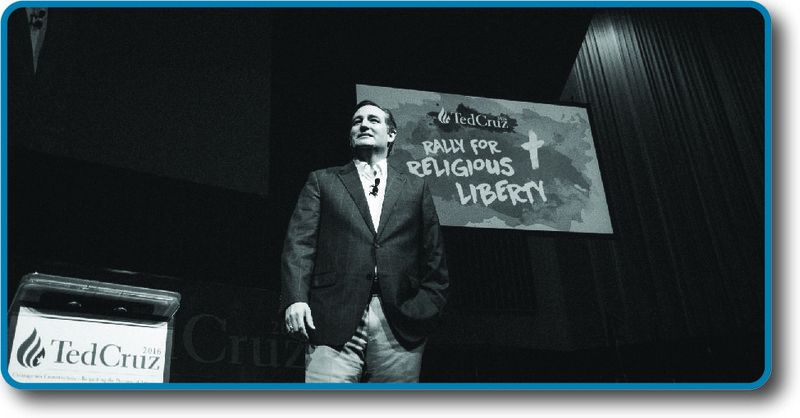 “Transcript: Ted Cruz’s Speech at Liberty University,” Washington Post, 23 March 2015. Like candidates for office at all levels of U.S. government, Cruz understood that campaigns must reach out to the voters and compel them to vote or the candidate will fail miserably. But what brings voters to the polls, and how do they make their voting decisions? Those are just two of the questions about voting and elections this chapter will explore.